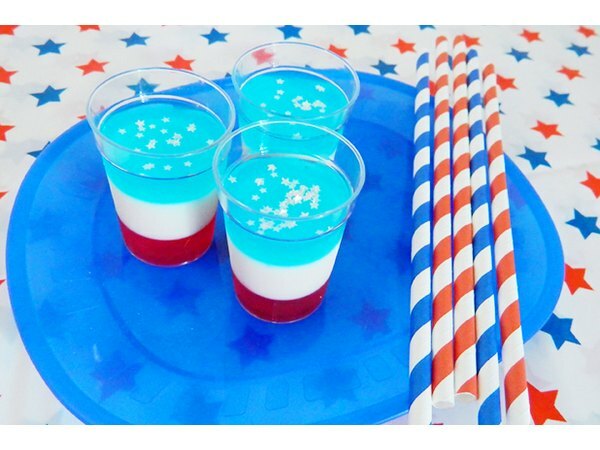 Red, white and blue jello shots are the perfect adult-friendly treat for a Fourth of July barbecue or any other patriotic celebration. 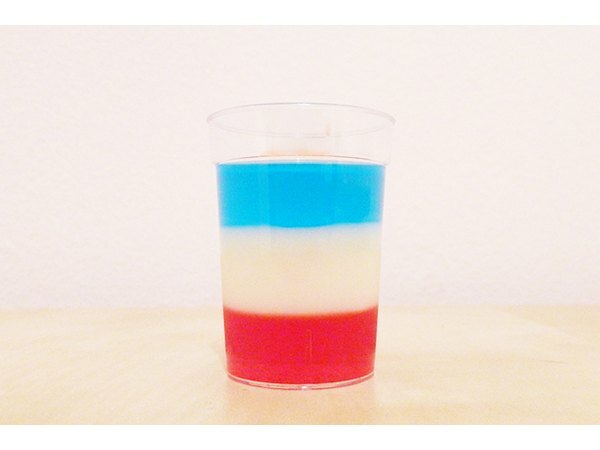 The following recipe makes between 45 and 50 jello shots. Set up the plastic shot glasses on the baking sheet. This will make it easier to transfer them in and out of the refrigerator while each layer of jello sets. Make the red layer of jello. Bring one cup water to a boil. Stir in 3 ounces of raspberry jello until fully dissolved, then add one cup vodka. Stir. Spoon the red mixture into the plastic shot glasses, filling each about a third full. 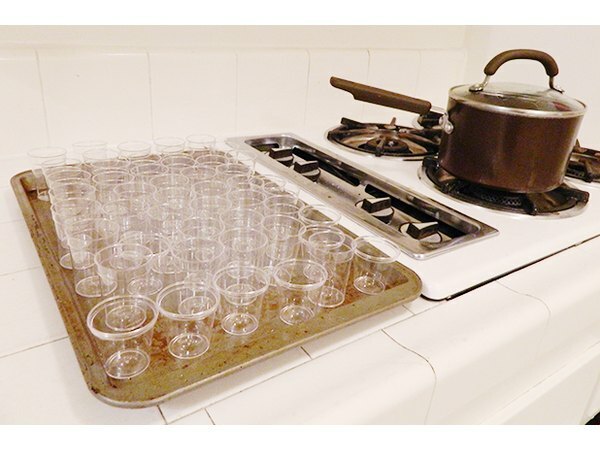 Place the baking sheet of shot glasses in the refrigerator to quickly set the jello. After the red layer is set (this should take about an hour) prepare the white layer, which is a bit trickier. In the sauce pan, heat 1/2 cup of water to a boil. Add the can of sweetened condensed milk. Add 1/2 cup cold water to a separate bowl, and sprinkle two packages of unflavored gelatin onto the cold water. Let sit for a few minutes, then add a 1/2 cup boiling water to the cold water and gelatin. Stir until the gelatin is dissolved. 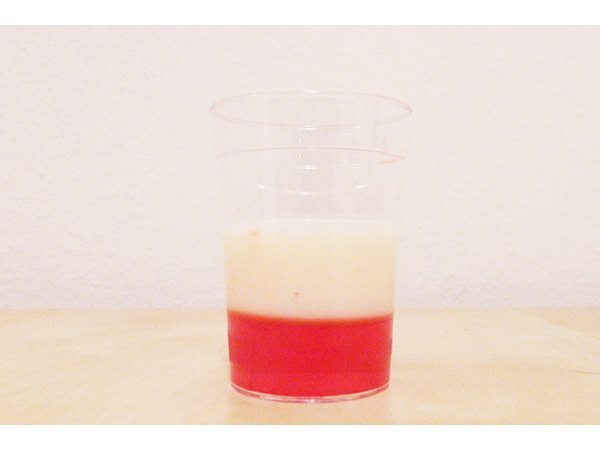 Add the gelatin/water mix to the sweet condensed milk mix and stir thoroughly. Add 3/4 cup vodka. Stir. Let cool, then spoon the mixture on top of the red layer of jello, filling up another third. Put the baking sheet with the shot glasses back in the refrigerator. After the white layer is set, prepare the blue layer. Bring one cup water to a boil. Stir in 3 ounces of blueberry jello until fully dissolved, then add one cup vodka. Stir. Spoon the blue mixture on top of the white layer of jello, filling up the final third. Put the baking sheet with the shot glasses back in the refrigerator. Let the jello shots set for at least one hour, but preferably two or three hours. 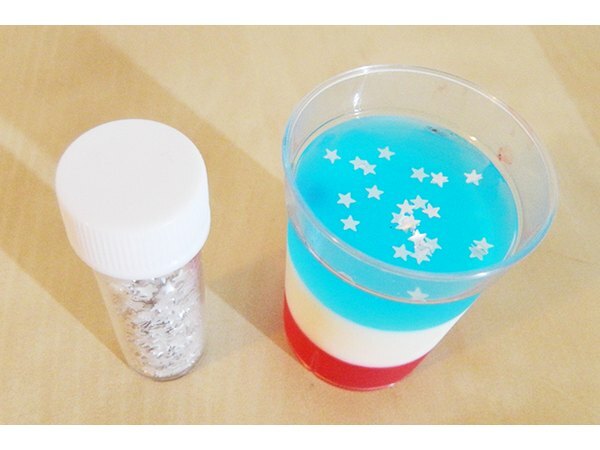 When they’re fully set, you can top them with edible star sprinkles to achieve the American flag effect. 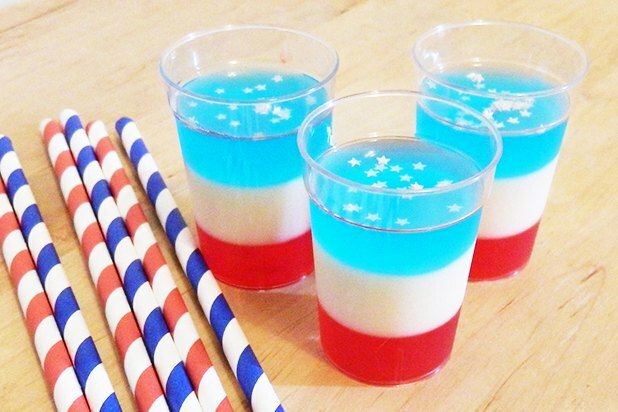 Serve with colorful straws or flag toothpicks so that your guests can easily remove the jello from the plastic shot glasses. Make sure to enjoy the jello shots responsibly—they are delicious, but they do have alcohol in them and should be consumed in moderation.